We just finished reading A Wrinkle in Time: The Graphic Novel in class, and some interesting questions were brought up. What role do comic books have in relationship to children? Can they be educational? And how are they supposed to help students become better readers? Well, these questions are actually being asked by plenty of educators, and – fear not – comic books are actually valued and used by many well informed teachers around the country. 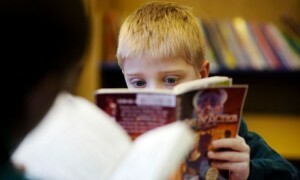 Some people had the notion that graphic novels and comic books are being used to “trick” students into reading. Any teacher who had dealt with reluctant readers knows there is no way to trick a student into reading if they have already made up their mind that they will not enjoy it. Instead, comic books and graphic novels are used as gateways to reading and writing in the classroom, and tackling two important aspects of furthering literacy: critical literacy and the literacy gender gap. So what is critical literacy? It is the process of encouraging students to question, explore, or challenge text, and empowering them to form their own opinion about certain beliefs and ideals. There are many graphic novels that could fall into this category. Art Spiegelman’s Maus is the first that comes to find. However, there are more. 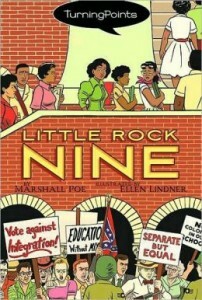 Little Rock Nine by Marshall Poe presents two sides of the same story. One told by William, a sixteen year old, white male living in Little Rock, Arkansas. The other is told by Thomas, the black son of William’s family’s maid. 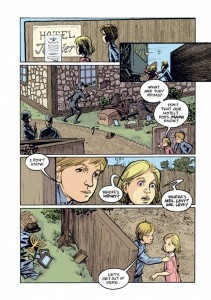 U.S. Constitution: A Graphic Adaptation by Jonathan Hennessey is a much more factually drive graphic novel that dissects that U.S Constitution and explores each article, the bill of rights, and every amendment in detail. 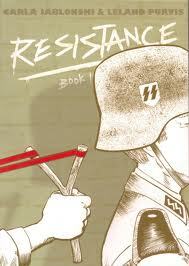 Another great example of a graphic novel that critical literacy can be applied to is Resistance by Carla Jablonski. This story takes place during Germany’s occupation of France, and explores issues such as adversity and selflessness. All of these stories are used to push students to high-order thinking, and encourage them to voice their opinions and beliefs through writing. Still, ‘why graphic novels?’ you may ask. Well studies show that this form of visual storytelling helps at risk students, students with ADHD, English Language Learners, and reluctant readers. One study decided to introduce comic books and manga into an urban high school in San Diego, and the results were astonishing. Within this school thirty languages were spoken by 2,200 students, who all qualified for federal free or reduced lunch. The books were given to students in a classroom designed for struggling readers and writers, most of which English was their second language. This study chose Will Eisner’s New York: The Big City as the first comic book to read as a class because of its urban setting. It is smart to assign books that students can make personal connections with. In the end, students’ confidence grew, and they were writing independently more often than before. What this study shows is that anyone can pick up a graphic novel and read through it critically. However, using graphic novels in a classroom evens the playing field for students that struggle with reading in one form or another. While there are many strategies teachers can perform to ensure engagement for young male readers, one of the simplest strategies is introducing boys to graphic novels. Why? Well, boys are also more likely to be diagnosed with ADHD. The excitement of moving from panel to panel and being able to quickly flip through pages provides is enough to engage students with ADHD. In other words, students do not feel restricted or threatened by a large page of boring black and white text. Instead, illustrations combined with text provided enough stimulation to engage students that find it harder to concentrate on one specific task. Providing a text like A Wrinkle in Time: A Graphic Novel allows students to participate in the same text as the rest of the class, while accommodating the novel to their needs. Another problem many teachers face within the gender gap of literacy is that boys do not associate reading as a stereotypical ‘boy’ thing to do. More recent figures (surveying 5-14-year-olds) indicate that 75% of both boys and girls spent time reading for pleasure and confirm that 68% of boys did so; although 41% of boys consider reading to be boring and 45% consider it to be nerdy, 23% think that it is cool. This is where graphic novels come into play. Many times they are looked down upon because of their association with comic books. So what! While there is a large audience of female comic book readers, for the most part, comic books within the United States have developed by appealing to men. Think of the number of male superheroes out there. Proving to students that they can enjoy reading when they find the right kind of book is essential in scaffolding them to a new level of reading. Let’s say a student is introduced to one of the graphic novels I mentioned before, like Resistance. When given a social studies assignment or non-fiction book about World War II and the Nazi invasion of France, they will already be interested and engaged because of their previous exposure to the subject. Without that graphic novel, many boys (or girls) would have put up a fight reading informative texts about some war that took place in the 1940s. The key is to find a book that sparks curiosity in students. It can be anything from Captain Underpants to The Invention of Hugo Cabret, as long as the text is visually engaging, the students will be more interested in literacy!